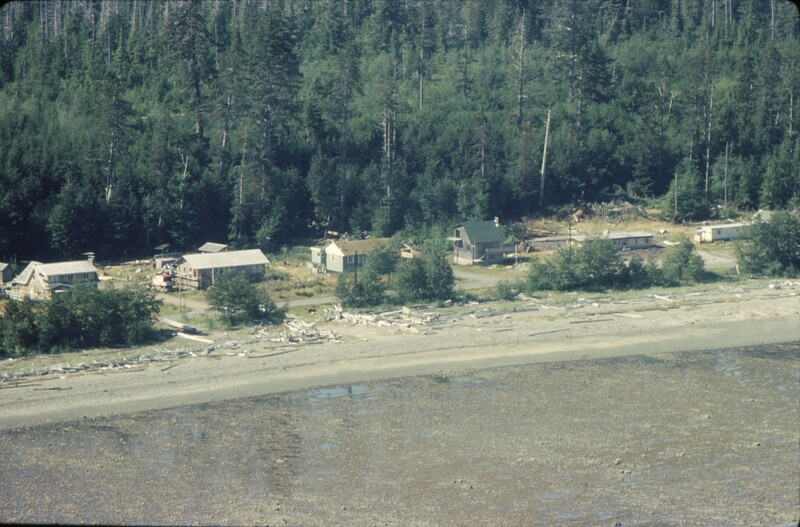 In August 1997, I flew to Sandspit, and from there rented a car to drive north to my first teaching job in Masset. 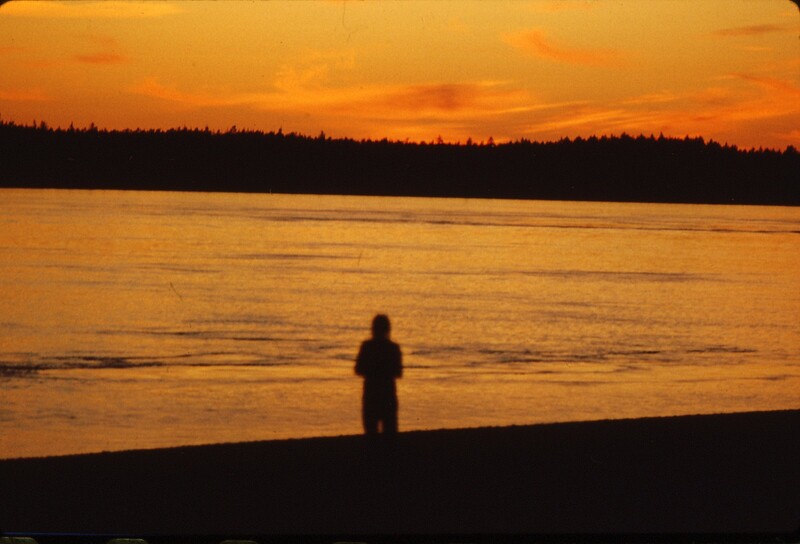 Here is a description of that introduction to the beautiful, amazing islands of Haida Gwaii. I tossed my suitcase in the car, and drove off down the narrow, twisting road which followed the shoreline. In moments I was passing a series of old homes, all of a generally same 1940s style. I realized these must be the houses that had belonged to a small air-force base located here during World War II, but now mostly owned privately. There was also a general store with a post-office sign attached, and a gas-station with one pump next to a pot-hole filled driveway. There was also a small school of perhaps 4 or 5 classrooms. This must be the southern island’s main community of Sandspit, I realized. 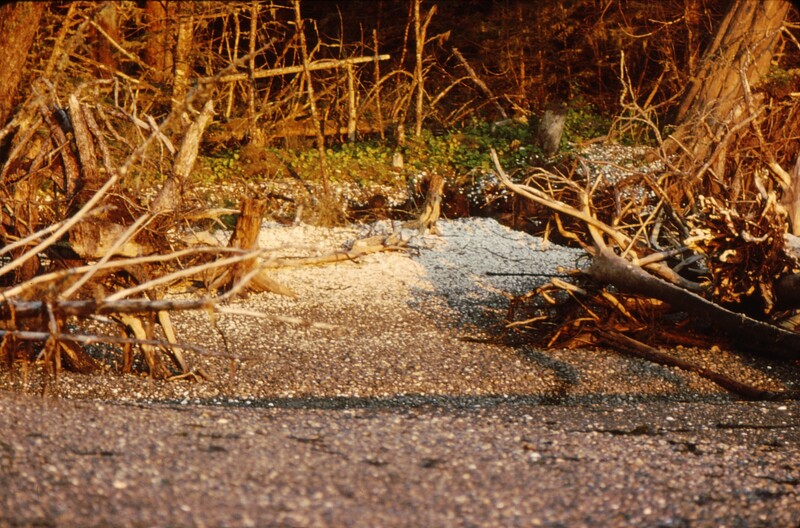 The shoreline on the opposite side of the road was wide and gravelly, at low tide, and the upper shoreline was covered with a wild jumble of bleached logs and other bits of flotsam tossed up in past storms and high tides. Within a half-mile or so, the town was left behind, and the road was bordered by rich, dark towering green forest on the south side, and wild rocky beaches on the north side. The view across the stretch of water between the south and north islands was breath-taking, with the white-capped waves splashing up against the rocky shoreline, and the inlet dotted with small, rocky, tree-capped islets. Driving slowly along the twisting road, I suddenly came to a stop at the end of a long line of vehicles which blocked the entire right lane. I noticed that most people were out of their vehicles and wandering around, chatting with each other, and enjoying the fine day. So I, too, got out of my car, grabbed my camera, and headed to the front of the line to see what was happening. The paved road came to an end at the ferry dock, although a dusty dirt road continued off into the distance. I walked down to the dock, where cars were being loaded onto a small open-deck ferry, which was already nearly full. It was clear I would have to wait for the next ferry, which, according to the sign, would arrive about half an hour after this one left. So I joined other travelers out on the dock next to the ferry slip and looked around. To the north was more of the beautiful ocean view. 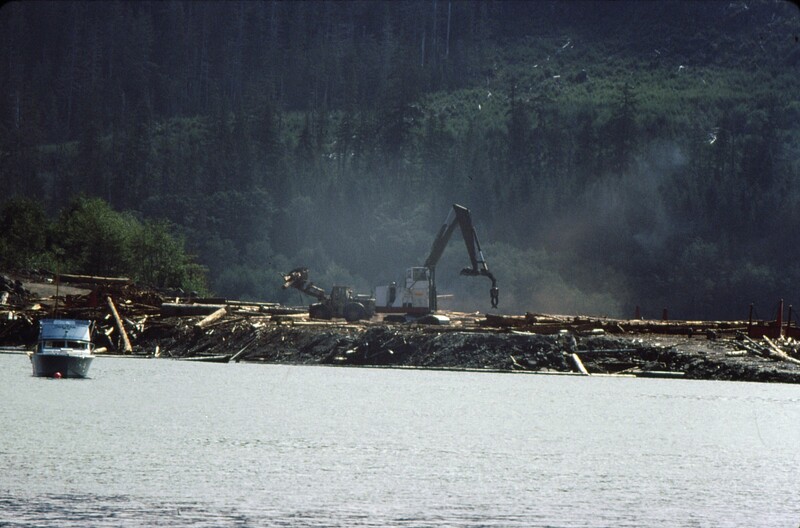 To the south, however, was a logging sort ground in full operation. Dust rose from the machines, and the noise of them boomed across the water, which seemed like a paradoxical contradiction to the quiet peacefulness of the ocean scene. On a rocky outcrop nearby, a few seals were soaking up the warmth of the late summer afternoon. Leaving the dock, I walked down along the shoreline, and was astonished at the piles of sun-and-sea bleached shells scattered across the upper reaches of the gravelly shore. Directly beyond the shells, the forest began, its green mossy edging and a tangle of brown twigs and dead fallen branches framing the white of the shells, with dark tree trunks creating a deep and mysterious-looking background. As the wait for the next ferry – and indeed, as it turned out, the ferry after that – passed by, the sun began to dip toward the horizon. I was surprised; it seemed early in the day, but then I remembered that I was a lot farther north now.The pale blue sky with its fluffy clouds changed into shades of yellow and pink, and the clouds themselves spread out thinly, adding to the pale water-color shades of the sky, and reflected their colors onto the water which was now still and quiet. Across the inlet, the shoreline of the northern island, and the small islets between, were black outlines dividing the sky from the water. Tree tops formed a sharp saw-blade line. Off in the distance, to the north-east, the water stretched out to the horizon, where the sky met the ocean in a watery-blue mist. This was the beginning of a long late-summer evening. And then it was my turn to load my car onto the ferry for the short ride across the inlet. Rolling off the ferry on the other side, I swung to the right and drove up the northern island, Graham Island, along a road that at first followed the beautiful, wild shoreline, and then cut across the island through a central plateau of scruffy forest and muskeg, passing through the communities of Skidegate, Tlell, and Port Clements. Finally I arrived in my new hometown, Masset, and following the map sent to me previously, I drove to my new home in the “Teacher’s Apartments,” and let myself in, using the key that had been mailed to me. Although it was furnished, as promised, there were no dishes, linens or other items. I had been warned about this, and had brought along a set of sheets and a blanket in my suitcase, along with a couple changes of clothes. All my other household goods, and my vehicle, were on their way to the islands on a barge, which was behind schedule, and had not yet arrived, a fact of life on the islands which I was quickly learning to accept: life moved at a leisurely pace here! Really like your posts, thank you for sharing them with everyone.